Infotainment centers were designed to make driving more enjoyable while reducing distractions. Android Auto takes that principle one step further by mirroring the apps on your phone or tablet to your infotainment center. Don't let offensive odors take over your brand new vehicle. Follow these simple tips to help keep your vehicle fresh and clean for years to come. If you smell something out of the ordinary in your vehicle, take a look around. Clean out old food wrappers, garbage, bottles, papers, etc. Try to keep your vehicle clean at all times. A dirty vehicle can quickly attract pests and rodents. If you are among the people that do not want to deal with a ton of hassles from using tires with studs or have a fast-paced lifestyle, then you might want to consider using a studless winter tire set. This will save you a lot of trouble that could occur when you are not on top of when to change out your tires. Driving in bad winter conditions isn't always easy for drivers. We at Hendrick MINI want to make sure you prepare for the weather with a winter survival kit. If you are driving through bad weather during a long trip, emergency preparedness is essential for yourself, your passengers, and your vehicle. Have you ever been driving on icy roads when your vehicle started to go out of control? This is called fishtailing, hydroplaning, or sliding. With icy roads, you have to be extra careful in snowy conditions. Icy roads can cause a vehicle's wheels to get stuck and slide together. While you may want to brake, if you press down too hard, you could be causing even more issues. There are a lot of different aspects of the infotainment system that come with many of the newest vehicles. We at Hendrick MINI are always interested in the types of features that allow people to connect and get information that is needed for their journey as well as enjoy some entertainment. Among the important information aspects of the infotainment system of many vehicles is the ability to help you with your navigation. You just have to enter information on what you are looking for and then it will display the needed information for you. You may have heard the word differential thrown around in the auto shop, but what does it do? When your service adviser says that the differential’s oil needs to be changed, he’s talking about the part of the car that helps your vehicle’s wheels rotate around. The differential of your car is located at the front or rear axle. Differentials help the axle turn the wheels so that they rotate properly. When you have front-wheel drive, your differentials will be in the back, and for rear-wheel drive, it’s the opposite. Do you know when your tires need to be replaced? Do you automatically replace them every year or wait until a problem arises? Good tires are needed if you expect a smooth ride with the best possible gas mileage. Come to Hendrick MINI and let us check over your tires and offer tips. Not replacing your tires when needed can cause expensive damage to parts surrounding the tires. It can also affect the ride your vehicle provides. Here are signs your tires need replacing. When you are shopping for a new vehicle, there are some minor features that you might want to think about before making a purchase. The majority of vehicles that are currently on the market come with some sort of spare tire. This spare tire can be used in the rare occasion that you experience a flat tire. Two different spares exist. There is the compact temporary and the full-size spare. Let's take a closer look. 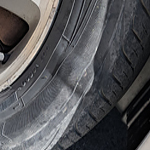 The compact temporary tire is a much smaller and simpler version of a normal tire.